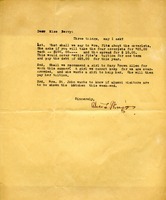 Alice L. Wingo writes Martha Berry regarding three questions she has about running of the school. In addition is a response from Berry to Wingo answering at least two of her questions. 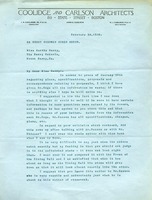 Architect Harry J. Carlson addresses Martha Berry's concerns about stonework and walls, saying that he is not concerned and suggesting that she depend on Mr. Hanson's expertise in the matter. He encloses a letter from Mrs. St. John but indicates that her suggestions cannot be implemented.